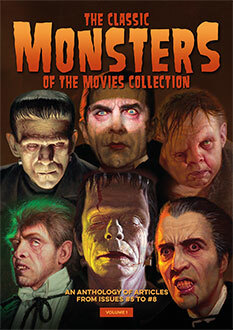 In the golden age of horror, MGM liked to think they ran a close second to Universal, although many of their features were criticised for lacking true supernatural context, such as the vampires being explained away as actors in Tod Browning’s London After Midnight (1927) remake, Mark of the Vampire (1935). 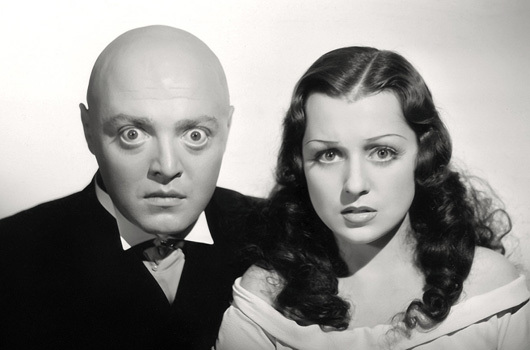 Their other 1935 entry, Mad Love, was no exception, although it still stands up today as one of the most genuinely nightmarish films ever to come out of Hollywood. 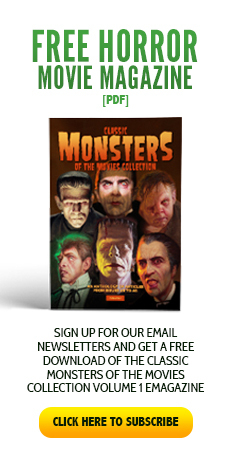 Seen in England as The Hands of Orlac, Mad Love was lambasted upon its original release, and berated by critics of the day as being “neither important or particularly compelling” (The Hollywood Reporter) and “completely horrible” (Time). It performed dismally at the box office, grossing just $170,000 domestically and a slightly better $194,000 internationally – disappointing returns on a budget of $403,000. The film was cameraman Karl Freund’s last turn in the director’s chair; he had really wanted to be at the helm of the camera, and antagonism between him, appointed cinematographer Chester Lyons and producer John Considine Jr bubbled on throughout production. 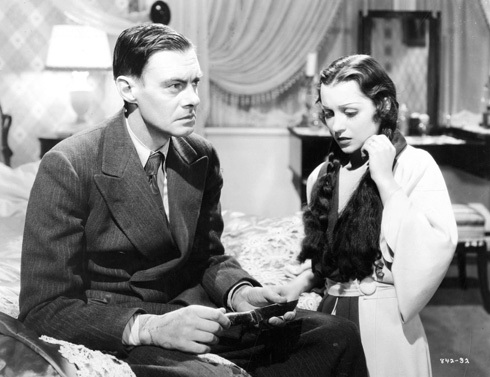 Performances generally also came in for harsh words from critics too, although Frances Drake and Colin Clive were more than suitable leads. But however good they were, their efforts were always going to be dwarfed in the shadow of a tour de force fete of acting from a young Hungarian actor making his American film debut: Peter Lorre. Lorre had made his indelible mark on world cinema with his portrayal of a childish child killer in Fritz Lang’s M (1931) and, finding himself in enforced exile in the early 1930s due to his Jewish descent, arrived in Hollywood via Hitchcock and England with The Man Who Knew Too Much (1934). 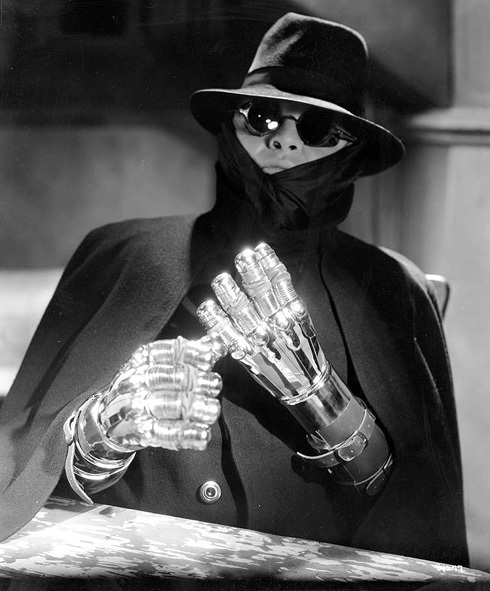 His scene stealing performance as the creepy, maniacal and obsessive Dr Gogol in Mad Love is one of the true great acting achievements in horror movies; the horrific apparition who meets Stephen Orlac (Clive) at the Inn of the Three Feathers, throwing back its cloak to reveal hands of articulated steel – “I have no hands. Your hands were mine once.” – and then his cape – “They cut off my head, but Gogol put it back!” – the hideous, bloated face, with its sinister grin peering out from a leather head brace is one of the most macabre, chilling moments in the hundred-and-odd year history of the horror film. Lorre’s performance led Charlie Chaplin to call him “the greatest living actor”. Based on Maurice Renard’s story The Hands of Orlac (Les Mains d’Orlac), Mad Love was a remake of Robert Wiene’s Austrian silent 1924 classic starring Conrad Veidt. With a screenplay by Werewolf of Paris author Guy Endore and additional treatment from John L Balderston, the story takes on a perverted sense of the original; the audience is aware of Gogol’s obsessive depravity from the outset, making for an even more haunting plummet into madness and chaos. Deeply infatuated with actress Yvonne Orlac (Drake), Gogol cannot accept that she is to give up her nightly show at the Parisian Grand Guignol Théâtre des Horreurs to live in England with her pianist husband Stephen. When Stephen’s hands are crushed in a train crash, she persuades Gogol, despite her better judgement, to operate to save them. Instead, he stitches on those of guillotined knife murderer Rollo (Edward Brophy). As Orlac becomes convinced his new hands have murderous tendencies, Gogol decides to exploit the fact to try and win over Yvonne. The day is saved when American reporter Reagan (Ted Healy) helps to unravel the crazed Gogol as he is about to dispatch Yvonne by strangling her with her own hair; Clive throws a knife, Gogol dies, the couple embrace and all, once again, is well. 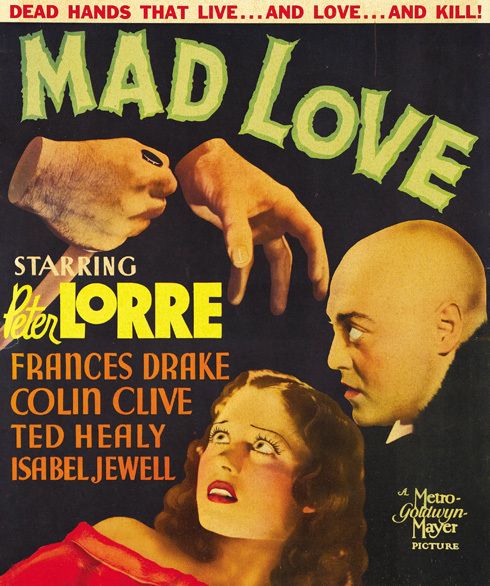 With a complex plot, stunning central performance from Lorre and neat, if troubled, direction from Freund, Mad Love remains one of the highlights of cinema even 80 years after its first appearance. Thankfully, modern critics have been much kinder to it, and it finally gets the recognition that it truly deserves as a masterpiece of twentieth century film making.